I have an uncle who works with governments in second and third world countries to build systems, policies and help advance their protocols into the new millennium. Right now, I believe he is in Bangladesh and has been for a few years on and off. When I was growing up, his home base was mostly Bogota, Columbia, where certain rebel groups made it quite dangerous to be for those who stood out. He and my cousins were there, and of course they were pretty well off compared to many locals. The chatter here from my parents and relatives seemed to indicate that because they were obviously wealthier, they had a vehicle, and they were foreign, they were at risk of being assaulted, kidnapped or even murdered. This wasn’t exactly comforting to my 12 year old self. Thankfully, nothing ever came to a forefront though there may have been one or two close calls. After this read, I have a chilling picture of what could have been reality in my very own family. Roxane Gay’s debut novel is one of the best books I have ever read. It is by no means “best” in the sense that it had the most emotionally positive plot, but it most definitely is the best for several other very important reasons. The plot is enthralling. 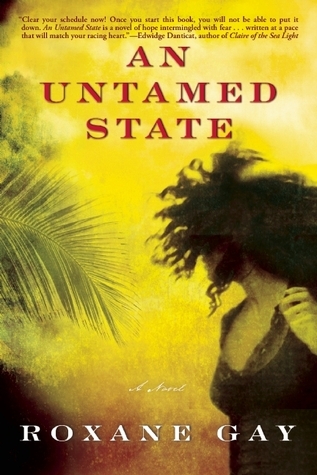 An Untamed State is the story of Mireille Duval Jameson, her horrific kidnapping and the havoc wreaked on her life and loved ones after such a traumatic experience. Events will terrify. Memories will draw you in. Tactics will shock you. Family will make you want to scream. Corruption will incite horror to your core. The after will be believable and relatable, yet completely traumatic. Just enthralling all the way through. I could not put it down. The writing is mesmerizing. From the opening sentence to the very last line, the intricacies of setting, emotion, and plot that are made so vivid through language flowing across the page left me in awe of the author’s abilities. I felt like I was reading a beautifully terrifying work of art. The story is vulnerable. After reading this book, there is no option for sweeping the damage done by an event like this under the rug. There is no possible way to ignore that a line has been crossed, and there is no going back. I was right there were Mireille, understanding why she felt the way she did, reacted the way she did, and moved forward after the kidnapping the way that she did. Because all of the feelings, fears, and memories are there for us to see, there is no implausibility anywhere. I heard her. I believed her completely. The issue is real, and made extremely poignant in this book. Kidnapping happens. And this is what it could look like; no holds barred. It is a traumatic, life changing event. While some events are not explained in as much graphic detail as others, there is more than enough for a powerful experience of understanding and emotional meltdowns to take place. Chapter after chapter I was angry, I was sad, I was frustrated, I cried. I foresee this book being hailed as one of the best books of 2014. It will be read, collected, reread, recommended, discussed, quoted, cried about and marvelled over long into the future. Do not miss it. This entry was posted in Muse Reviews and tagged book recommendations, Book Review, Family, Haiti, Kidnap, Marriage, Must Read, PTSD, Trauma. Bookmark the permalink.